The Port Phillip and Westernport region has a great diversity of soil types that reflect differences in parent material, topography, climate, organic activity and age (e.g. degree of weathering). For agricultural purposes, many of these soils have some chemical and physical limitations (eg. acidity) which require careful management. 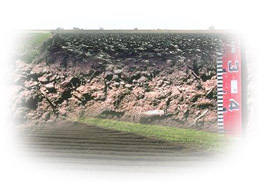 Regional soil/landform mapping (at 1:100 000 scale) and soil site descriptions are provided on this site for some areas. This information will continue to be developed and updated. Information on soil management will also be provided as it becomes available.